2. To Prepare the Pie Shell: On a lightly floured work surface, roll out half a ball of dough into a 10-inch circle. 3. Place the circle in a 9-inch pie plate so the edges of the circle drop over the rim. 4. Using your thumb and index finger, crimp the edges of the pie shell. 5. Brush the edges with heavy cream to create a golden brown finish. Set the pie shell to the side. 7. Add the warm melted butter, and mix well. 8. In a separate bowl, combine the pecans and chocolate. Sprinkle the mixture over the bottom of the pie shell. Pour the filling over the nuts and chips. 10. Transfer the pie to a wire cooling rack, and let it cool for 2 to 3 hours before serving. 11. Serve with a drizzle of Bourbon Sauce or ice cream. Note: This pie is best served at room temperature or warmed at 350 degree F for about 10 minutes. Store it in the refrigerator for up to 5 days, or wrap it in plastic wrap and freeze it for up to 2 weeks. If you’d prefer not to use all-Crisco, you can substitute an equal amount of butter or use a half-butter, half-shortening mixture. 1. In a medium bowl, mix the flour and salt. 4. Add the water, 1 tablespoon at a time, delicately incorporating each tablespoon. (You may have to use 1 more or 1 less tablespoon than the recommended amount, depending on the humidity.) You’ll know you’ve added the right amount of water when the dough forms a ball that easily holds together. 5. Wrap the ball of dough in plastic wrap, and chill it in the refrigerator for at least 30 minutes. 6. Divide the dough in half. You now have enough dough for either two 9- or 10-inch single crusts or one double-crust. 7. For this pie,wrap and store one-half of the dough in the refrigerator for up to 5 days for future use. Take the remaining half of the dough, and use it for this recipe. 1. In a heavy-bottom medium saucepan, melt the butter and brown sugar over medium heat, whisking continuously for 6 to 8 minutes, or until the butter melts and the sugar is dissolved and turns light brown. 2. Slowly whisk in the cream, and then the bourbon. 3. Use immediately, or let the sauce cool to room temperature. Transfer it to an airtight storage container and refrigerate for about 1 week. Oh my! When I see a recipe with such long involved directions I often wonder if it’ll be worth the effort involved to make it. Maybe I’ll look back over some of your other pecan recipes. 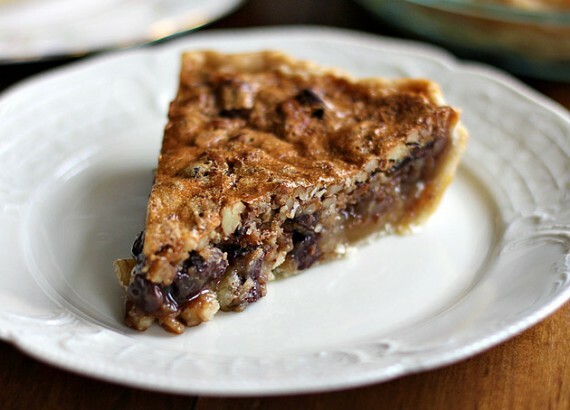 One pecan pie recipe has a layer of chocolate chips on the bottom. Yum!